“The Thin Red Line” is a lyrical catwalk onto a barren shore. The film is nourished by ideas, the indemnity of foreclosed dreams, the artifice of young wisdom. James Jones, the author of the book on which the film was based, hated war films, for the most part, giving them short shrift for their phallic heroism and sculptured morality. Jones passed, in 1977, before he could see his book become adapted into Terrence Malick’s vision: an 1,000 mile stare interrupted by blips of weathered poetry, arboreal slivers of sun, contagions of emotional malaise. “The Thin Red Line” is a war film, this much is true, from the speckles of faraway gunfire to tufts of exploding grass ripped from their island roots. The airy, ethereal tone, defined here by the vision of an insect eaten leaf, is a perforated gateway to a strange land of safety and danger: nature a warm deity capable of mercurial chaos, man a boundless reflection of that very same contained recklessness. The film, though having the window dressing of big name stars, skips them, like the throw of a stone, as Malick uses nature, and its reptilian dwellers, as the real marquee headliners. One narrative, wafting over scenes of watercolor brutality, seems omnipotent as God’s voice. The poetry and existential quandaries put forth, read over scenes of rattled bones and dented bayonets, isn’t, from its warped and contradictory text, as simple and perfunctory as the morals of a bible verse. The words are flowery and barbed, each stanza driven by a warble or a drawl, as the orator of these steely juxtapositions makes his philosophy about life in strangely incomprehensible – but extremely heartfelt – way; it doesn’t necessarily matter that not all of the words click, in ornate sentences or powerful maxims, because the obtuse, fluttering combination of words that are, in fact, muttered are said with such curious confidence and wretched emotional strain that one never questions their meaning or from where they came. “The Thin Red Line” has always been one of the most existential war pictures ever made, sweeping up feelings of remorse and irreparable solace, not seen since the original “All Quiet on the Western Front”. All of the characters, as mentioned in several other essays on this picture have said, are everyday men, patriots of their own struggles. The tall grass on a foreign island are like dreamcatchers to what could have been, what should have never been. Some have found fault with the ornery Lietenant Colonel Tall (played by a cosmically unhinged Nick Nolte), whose rabid orders are woven by the fleshy scythe of his wagging tongue. There is little calm in his soul, as he has been ushered into a realm of pressed uniforms and ulcerous oaths of duty from his collar pulling superiors. Given the way his morality has been whittled over time, he is, evidenced by his verbose and ungainly strategies on the island, a small child in the body of an hour glass; he knows his time is running out, and he wants to further himself in his career. 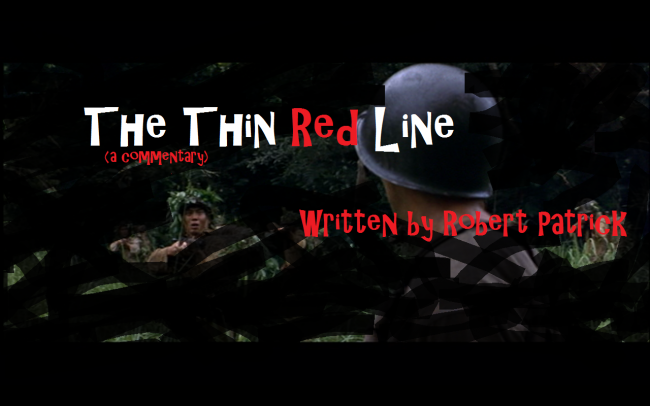 Not so strangely, “The Thin Red Line” has been regaled and hated; sworn against and revered. Once the Criterion Collection put their meat hooks into the picture, it has, because of the crescent moon on the front of the box, become officially revered by wider audiences outside of the circle of the generally austere and unflappable quarters of professional critics. The picture isn’t necessarily an exercise in mood as it is a memento to what it feels like to be forced to equate your losses into a flurried speck of poetry; to make sense of something that cant be dissected by a compendium of words, but instead a cacophony of confused, and explicitly feigned, ideas.